Creamy mashed potatoes with sweet roasted red pepper and salty feat cheese along with some fresh oregano to pull everything together. When I was thinking of side dishes for the big meal I couldn’t help but think of mashed potatoes which are nice and easy and always a hit. One of the things that I like about mashed potatoes is that there are just so many different things that you can do with them and I am always experimenting with them. I have been wanting to try using roasted red peppers and now was the perfect time to try them out along with some feta and oregano. 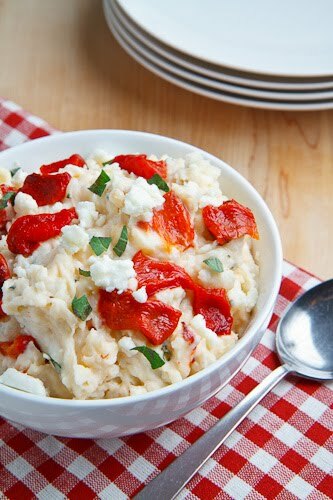 The sweet roasted red pepper and salty feta flavour combo is a particularly nice one that I enjoy using in many dishes and it works out really well in these mashed potatoes that are made nice and creamy with some thick Greek yogurt. Another great thing about mashed potatoes is that they can be done on the stove top and on a day when you are roasting your meat it is good to be able to keep your oven free of one more dish. Boil the potatoes and garlic in enough water to cover over medium-high until the potatoes are fork tender, about 20-30 minutes, drain and mash. Mix in the butter, yogurt, roasted red pepper, feta, oregano and lemon juice and season with salt and pepper. Beautiful as always, Kevin! And I think added smoky sweet roasted red peppers, salty, tangy feta and Greek yogurt really makes mashed potatoes special…and perfect for serving with roasted chicken or something simple. Love it. You are even creative with the most simple dishes! Those are really good additions! I like mashed potato but it really does need a bit of a flavour boost. I'll be honest, I usually skip over the mashed potatoes just cause there are usually better things at the T-Day table for me to stuff my belly with…but these I think I could become addicted to! That is a fabulous side dish. I really love the addition of roasted bell pepper and feta. These would steal the show Kevin! Yum, I'd love of a bowl of these mashed potatoes right now! Great idea, and easy to make low fat! YUM! totally whipping some of these up. This looks too tasty to be true! This is really unique and sounds lovely! Ohh feta and mashed potatoes just sounds fabulous. Great tips! Thanks for sharing! I`m gonna tweet about your blog! OH MY GOODNESS, this looks smashing. Those potatoes look awesome. I never would have thought to add that combo of ingredients – but what a great new way to serve them! Great Greek twist on a classic dish! I want to eat a huge bowl of these potatoes topped with chicken souvlaki! OMG these look amazing!! Anything that has to do with mashed potatoes and feta makes me happy! Side dish? I could eat that by itself and be content! Happy Thanksgiving Kevin.